Orange, Bergamot & Neroli create a very special, luxurious and fragrant soap that's gentle and mild to use by anyone. This warm and sensuous fragrance is a welcome addition to any bath or shower. Hummingbird Artisan Soap with a blend of bergamot, neroli and orange oil is the perfect antidote after a hard day. 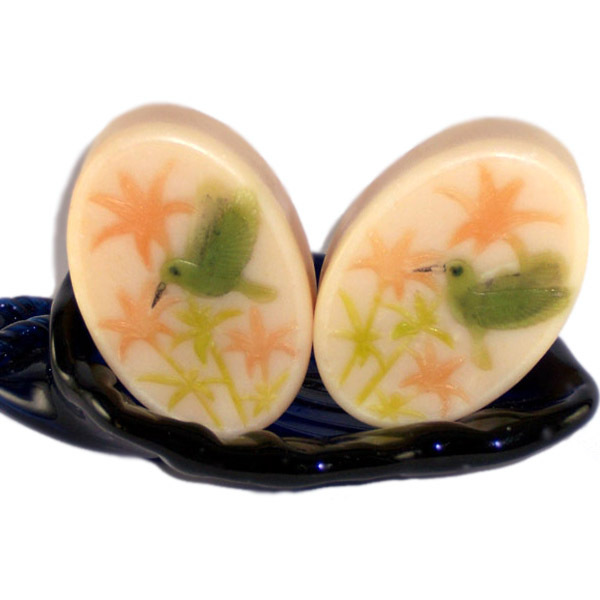 Each handcrafted bar is oval and has a hand painted hummingbird with lily flowers and green leaves. The lather is soft and creamy. Hummingbird Citrus Orange soap is handcrafted, so it’s mild and gentle. It can be used by anyone. Buy this soap for your bath, shower or put a bar by the bathroom or the kitchen sink. Each soap comes packaged in a pretty paper soap box, so it is ready to use as a gift for a birthday, baby shower, a thank you gift, or buy one for your favorite teacher. Lather up with this uplifting soap and let the cares of the day wash away. The fragrance is gentle and very pleasant. Hummingbird soap with citrus orange, bergamot and neroli has a warm and uplifting fragrance that is a welcome addition to any bath or shower. This batch as been cured for over six weeks, so all the water can evaporate. Curing or aging makes the soap milder. Due to the natural glycerin content, it’s best to keep Hummingbird orange soap dry between uses. Use a draining soap dish and keep the soap out of direct water spray. This way it will last longer. Ingr: Olive oil, Coconut, Palm Kernel, Mango Butter, Castor oil, Soybean, Sodium Hydroxide, Beeswax, Fragrance, Sodium Lactate. Each bar is hand painted with flowers and a hummingbird.